There is a very convenient Vagrant box available at https://app.vagrantup.com/commjoen/boxes/trainingbox (🔬) from @commjoen which comes with latest Docker containers of the OWASP Juice Shop, OWASP WebGoat and other vulnerable web applications as well as pentesting tools like OWASP ZAP. Open and login (via az login) to your Azure CLI or login to the Azure Portal, open the CloudShell and then choose Bash (not PowerShell). For more information please refer to the detailed walkthrough with screenshots by @JasonHaley. You can alternatively follow his guide to set up OWASP Juice Shop as an Azure Web App for Containers. To show the possible impact of XSS, you can download this docker-compose-file and run docker-compose up to start the juice-shop and the shake-logger. Assume you received and (of course) clicked this inconspicuous phishing link and login. Apart from the visual/audible effect, the attacker also installed an input logger to grab credentials! This could easily run on a 3rd party server in real life! This is the official companion guide to the OWASP Juice Shop. It will give you a complete overview of the vulnerabilities found in the application including hints how to spot and exploit them. In the appendix you will even find complete step-by-step solutions to every challenge. 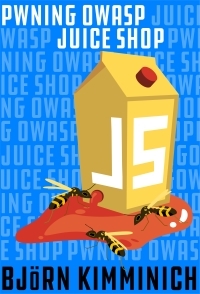 Pwning OWASP Juice Shop is published with GitBook under CC BY-NC-ND 4.0 and is available for free in PDF, Kindle and ePub format. You can also browse the full content online! If you need help with the application setup please check the TROUBLESHOOTING.md or post your specific problem or question in the official Gitter Chat. Did you write a blog post, magazine article or do a podcast about or mentioning OWASP Juice Shop? Or maybe you held or joined a conference talk or meetup session, a hacking workshop or public training where this project was mentioned? Add it to our ever-growing list of REFERENCES.md by forking and opening a Pull Request! On StickerYou.com you can get variants of the OWASP Juice Shop logo as single stickers to decorate your laptop with. They can also print magnets, iron-ons, sticker sheets and temporary tattoos. The most honorable way to get some stickers is to contribute to the project by fixing an issue, finding a serious bug or submitting a good idea for a new challenge! We're also happy to supply you with stickers if you organize a meetup or conference talk where you use or talk about or hack the OWASP Juice Shop! Just contact the mailing list or the project leader to discuss your plans! ! PayPal donations via above button go to the OWASP Foundations and are earmarked for "Juice Shop". This is the preferred and most convenient way to support the project. OWASP hosts a donation form on RegOnline. Refer to the Credit card donation step-by-step guide for help with filling out the donation form correctly. For a list of all contributors to the OWASP Juice Shop please visit our HALL_OF_FAME.md.